Easiest and fastest way to understand the human behind the screen. understand the human behind the screen. Try with your site now! No credit card required. No commitment. 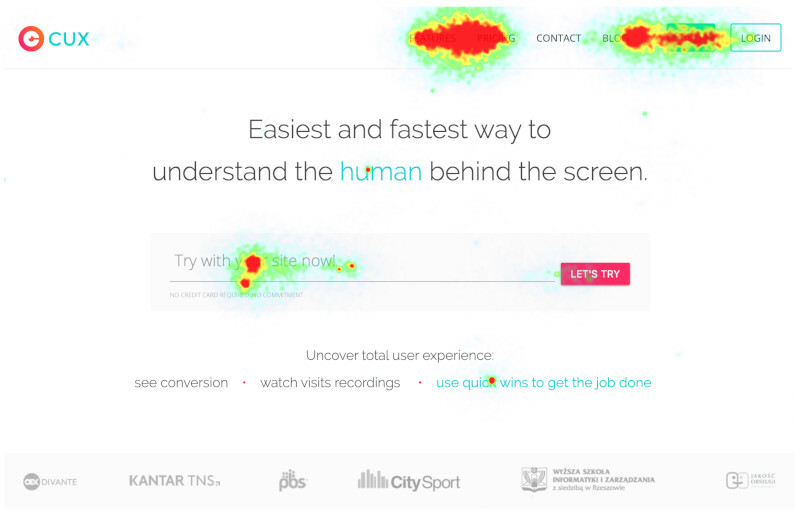 Pixel perfect picture of the hottest spots on your website for ALL devices and resolutions. See how users move not only through the page itself, but also through groups of identically designed pages or categories. Analyze easily how people buy different products in your e-commerce or how they read different types of articles on your blog. Filter heatmaps not only for desktop/mobile devices, but also for all wearable and embeddable ones. Be ready to design for the specific user segment. Playback of every click, scroll, zoom, mouse movement and tab visitors ever opened. Users love to open many tabs. See when they compared products or opened articles to read them later. Don't loose the track anymore. With CUX you can solve the issues instantly. Don't waste your time on waiting for data aggregation. CUX records up to 100% visits, no retention time. Watch them any time you need. 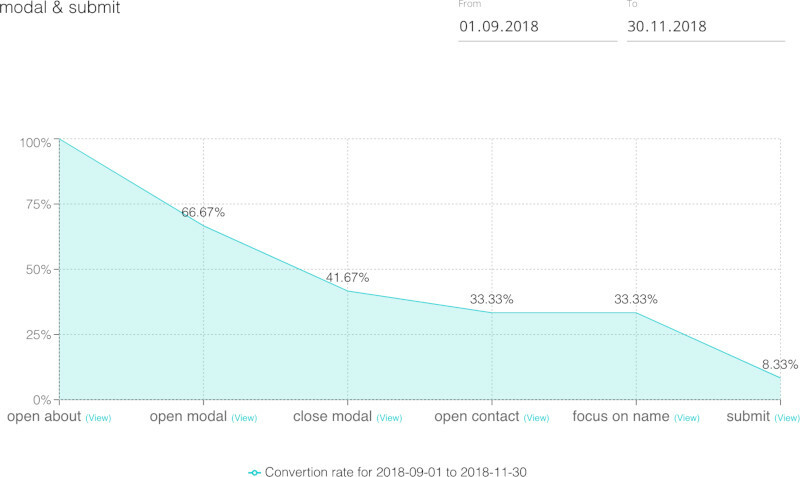 Conversion rate based on page loads, events and combined with visit recordings. Conversion is not only URL based anymore. Analyze every single action no matter if it is click, scroll, input fill or form submit. Precisely identify the issues on every user step. No more engaging developers. CUX capture all events automatically. 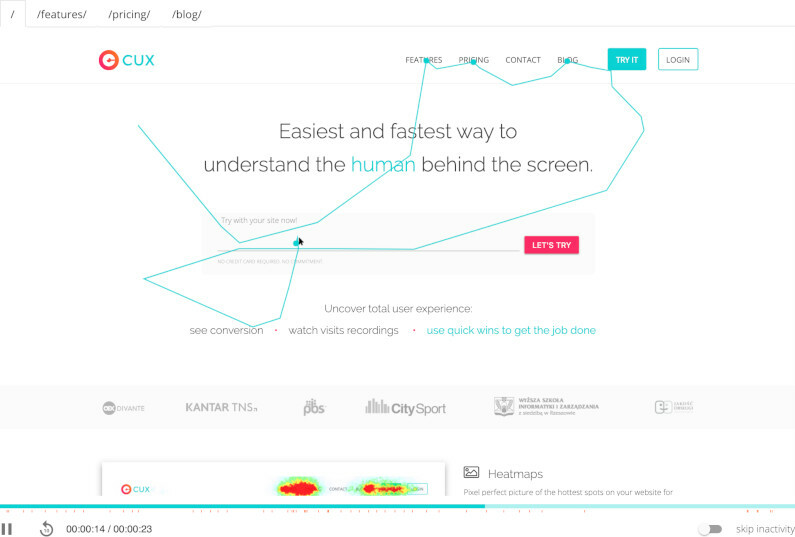 Codelessly set up any user journey and see how they convert. Watch filtered recordings to understand why people drop out at each step of journey.